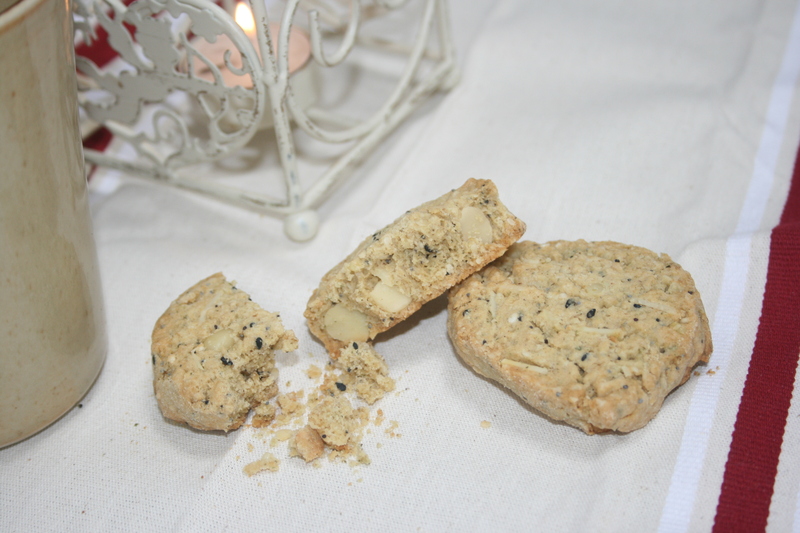 Cookies for fit-birds, with seeds and spices! Seeds are not just for birds (as my eldest keeps complaining…), they are also a very good healing food and can be used very successfully in baking. To breads, cookies or even fruit cakes, they give a deliciously healthy dimension. 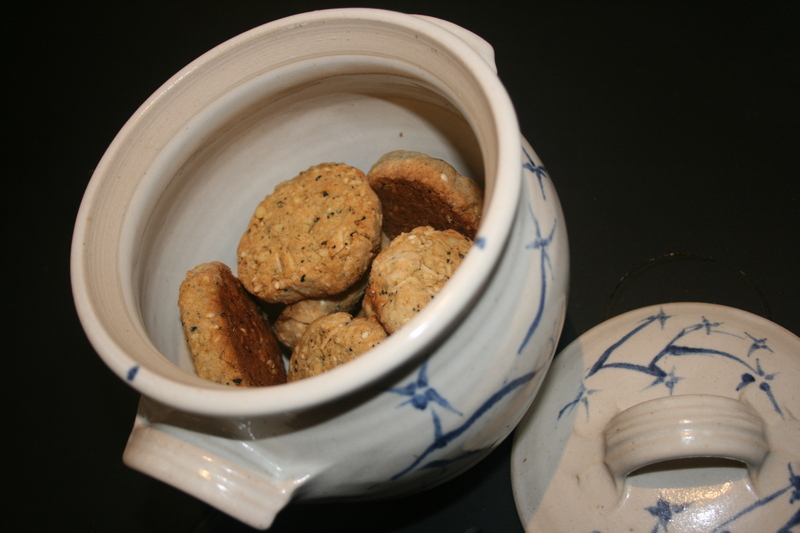 These seeds cookies are adapted from the recipes of a lovely Jersey restaurant “The Jersey Pottery”; taken from the book Handmade and homemade, recipes from Jersey by Jersey pottery. I made my version gluten-free and I added xantham gum for extra binding but you can use normal wheat flour if you prefer. This mix makes about 15 biscuits. I used pumpkin butter instead of pumpkin seeds because I had ran out and I swapped part of the sesame seeds for japanese black sesame seeds because I like the dark speckles in these biscuits. I also used gluten-free flour but you don’t have too. If you do though, add a spoonful of Xantham gum and that worked really well to bind the mix. The texture was dense but flaky and had a nice crumbly feel in the mouth, a little bit like a spanish ‘polverone’ which I found intensely pleasurable. The taste is nutty and subtle – not too sweet. They would go very well with ‘grown-up’ teas such as a smoky Lapsang Souchong or the neroli flavoured Earl Grey sold by The East India Company. First sift the flours and spices together. Combine the butter, sugar and egg to make a paste. Then bring all the ingredients together to produce a cookie dough. Dust the worktop with flour and roll the dough until you get a nice thick log. Wrap it in cling film and let it harden in the fridge for a few hours. Bake at 170° for 15 to 20 minutes or until the bottom bit gets slightly brown. These biscuits hold quite well through baking so you don’t need to space them out too much as they will keep their shape. You can even use a cookie stamp to personalise them! Linseeds or flaxseeds are a good source of vitamin B6, iron and Thiamin. Thiamin (or vitamin B1) is essential for your nervous system. Pine nuts, like all other seeds and nuts, bring you a lot of Omega-3 and Omega-6 fatty acids and help look after your skin, eyes and joints. They are also great at regulating moods and at helping children concentrate. This entry was posted in baking, treats and tagged birds, cookies, gluten-free, Jersey, linseeds, seeds, tea-time, xantham gum. Bookmark the permalink. Thanks for the compliment. These work very well with seeds only! Hope your daughter enjoys them. you’re welcome, I’ll try it out next week and let you know.